In the worldwide disk array and external storage array market, the traditional vendors (e.g. 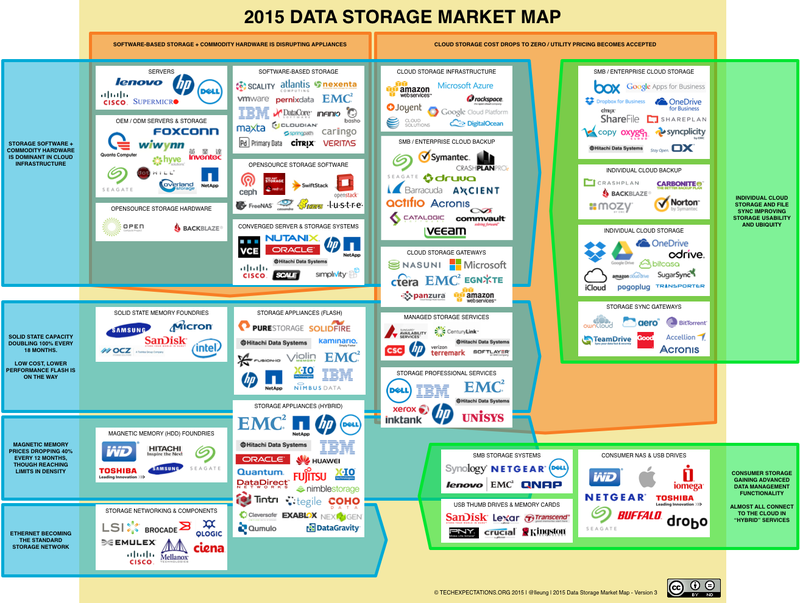 EMC, NetApp) are being disrupted from all sides, but most noticeably from the ODM manufacturers (e.g. Quanta, Inventec) and the software-defined storage (though a large amount of it is bespoke AWS, Facebook, and Google software) that runs on these “white boxes.” According to IDC, the ODMs collectively showed the greatest amount of revenue growth (22% Y/Y) and an amazing 43% of all capacity shipped, collecting over $1 billion in Q3 2014. Flash arrays and converged appliances also clearly made an impact, with Nutanix reaching a $300 million annual run rate, Pure Storage approaching a $200 million annual run rate, and EMC’s XtremeIO accelerating beyond a $500 million annual run rate (though arguably on the back of cannibalizing EMC’s own DMX high-end revenue – separate article on that later). It will be interesting to see the impact of the denser, slower flash storage that Sandisk just announced in March. Cloud storage has had a quiet year after the aggressive price cutting in early 2014. But it is very clear that business is booming. We’ll hopefully have a closer look later in the year when AWS finally reveals their revenues, which have been estimated at nearly $4 billion by some analysts, growing 67% in the latest quarter, with “usage” growing 90%. Despite Box’s struggles to IPO and properly report earnings, they are still generating over $200 million in annual revenue, with 275,000 companies as customers. It makes me wonder how much revenue Dropbox is generating, with it’s 300 million users and 4 million businesses.